Mayor Sergey Sobyanin takes the tricks Russia plays on foreign audiences and puts them to use against his own constituents. 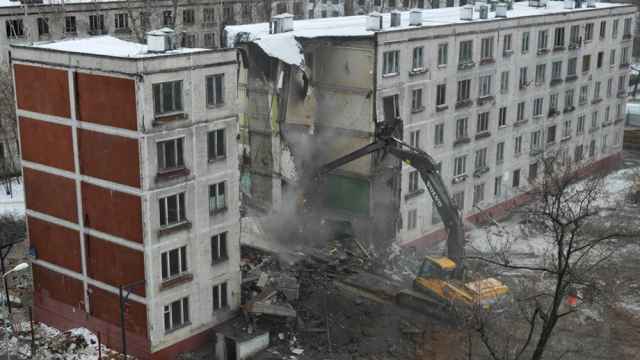 As soon as Moscow Mayor Sergei Sobyanin unveiled his grand plan in March to demolish thousands of cheap Soviet-era apartment buildings, Russian social media buzzed. Sobyanin’s plan to wrecking-ball the flats known as khrushchevki and replace them with high-density skyscrapers, would be little short of a PR grandslam, if the Russian Internet was anything to go by. By now, there are dozens of community pages on the social network Vkontakte with names like “We Support the Demolition of the Khrushchevki.” Roughly 10,000 accounts have joined in enthusiastic support for Sobyanin’s program on one of those, churning out dozens of posts and comments on Vkontakte and other platforms. The group also promotes itself aggressively. It has bought ads on social media that have hounded Moscow’s Internet users for weeks. But on closer inspection, these “ordinary Muscovites” complaining about their unbearable lives in “shabby homes without elevators or garbage chutes, with leaking roofs and smelly basements,” may not be who they seem. First, in many cases, the individuals’ lifestyles, displayed proudly on Instagram, suggest that they could probably afford better homes for themselves and their families. For example, one man seems preoccupied with his flashy Mercedes — a sports car that probably costs almost as much as his supposed dingy Khrushchevka apartment. Another young woman (also a fan of high-end Mercedeses) diligently documents every breakfast she’s had at Moscow’s most expensive restaurants. The same person also happens to be the daughter of a local functionary for the political party United Russia, which dominates Moscow’s landscape at every legislative and executive level. 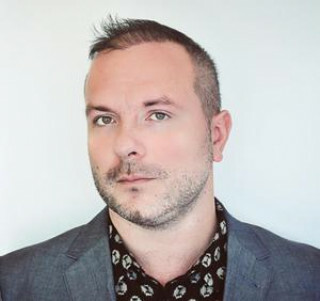 Even a quick glance at their social media profiles of pro-demolition online activists suggests that least some harbor connections to the mayor’s office itself. For example, two of the page’s administrators, as well as most of the people posting content, are members of the so-called “Youth Chamber” — a quasi-parliamentary body with no real legislative powers, whose members the mayor’s office encourages to engage in “civic activities” like organizing a local sports event or inspiring patriotic creativity in their neighborhoods. The chamber — led by a former pro-Kremlin youth movement leader — promises a successful career in the Moscow government in exchange for loyalty and active promotion of the mayor’s agenda. Below the surface, however, the “Youth Chamber” seems to be little more than a state-sponsored troll farm. Last year, Leonid Volkov, an Internet freedom activist who now manages Alexei Navalny’s presidential campaign, revealed in a series of blog posts how the “Youth Chamber” really operates. Volkov has some experience dealing with Moscow’s mayor, also having managed Navalny’s mayoral campaign in 2013, when the opposition maverick nearly forced a runoff vote against Sobyanin. Members of the chamber, Volkov wrote, are employed by the mayor’s office wishing to sway the public opinion on important city matters as real-life bots — not automated software but actual persons, acting as a coordinated network. Members are given bullet-pointed instructions on how to write about far-reaching measures the city government wants to implement, such as large-scale infrastructure projects and demolitions. But what’s the point of these complicated online campaigns, when their provenance is easily deduced and “Youth Chamber” members are called out as “Sobyanin shills” on social media? Anton Merkurov, a prominent Russian media expert, says the endgame is not so much to convince Muscovites to support City Hall’s policies, as it is to convince the mayor himself that his electorate is rallying around him. “Both Sobyanin and Putin are completely detached from the reality on the ground. They only know of the outside world what their aides tell them. 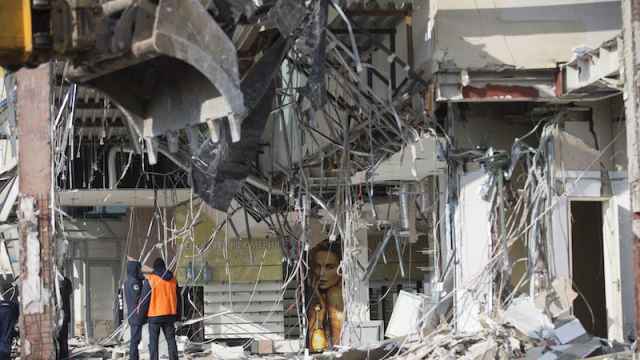 And their aides are only interested in securing more money for propaganda,” Merkurov said. If you actually look at these Twitter accounts, however, you’ll see that most of them belong to local council members and members of Sobyanin’s own political party, United Russia. But “astroturf” youth activists and local councils are hardly the Moscow government’s only means of promoting its agenda and drowning out opposing voices. City Hall’s schemes to influence the public often flirt with outright criminal activity, as well. 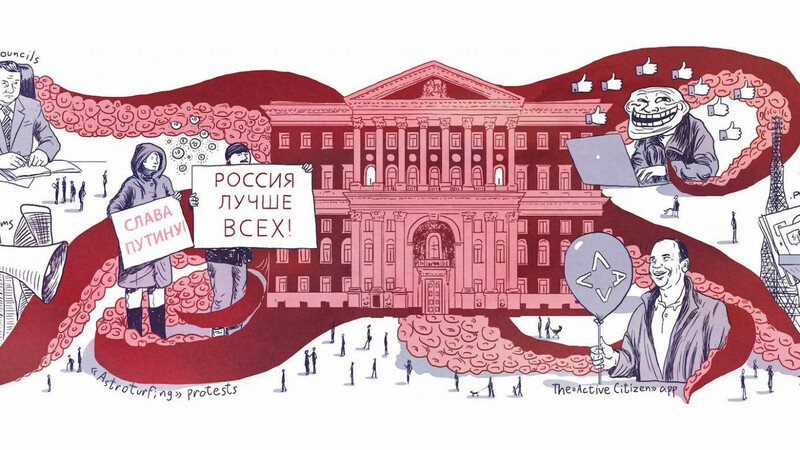 An investigation by The Moscow Times revealed that Mayor Sobyanin’s office in fact manages the “We Support the Demolition of the Khrushchevki” community group on Vkontakte, controlling the group through a shady network of companies. But a more honest explanation of MIT’s activities is that it serves as a vehicle for subversive propaganda on the city’s behalf. A series of stolen emails released by the hacker group “Shaltai Boltai” (whose members the Federal Security Service arrested earlier this year) shows that MIT was involved in a clandestine program to conspire with the Russian media by running articles discrediting opposition candidates in local elections. This effort included fabricating evidence against opposition activists and suppressing unwanted coverage — a clear violation of Russian media laws. According to the organization’s leaked ledgers, MIT used to funnel up to a million rubles ($17,000) from the mayor’s office for a single newspaper story that either praised City Hall or smeared its opponents. Media outlets published these stories with phony bylines, disguising the fact that this content was essentially a paid advertisement. The mayor’s office also manipulates the media for favorable coverage through other, more legally sound but still surreptitious means. 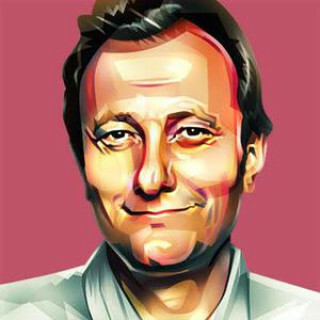 On top of maintaining a legitimate media empire funded to the tune of 13 billion rubles a year ($230 million) that includes several TV channels, radio stations, and online news websites, Sobyanin’s administration heavily invests in swaying the agenda on Yandex.News, Russia’s biggest online news aggregator. MIT plays a role here, too. An investigation by the independent news outlet RBC showed that Moscow’s authorities have found a way to dominate the news agenda when it wants, drowning out unfavorable stories with its own. MIT devised a scheme wherein Moscow’s neighborhood councils (most of them totally loyal to the mayor and to United Russia) set up dozens of similar news websites that are capable of firing off volleys of nearly identical news articles promoting the mayor’s initiatives. This onslaught fools Yandex’s algorithm into thinking that something important is happening. The news aggregator doesn’t differentiate between the sources, and thus assumes there’s a news event that deserves top billing in its ranking system, if hundreds of different outlets are reporting on a single event. Even the most trivial stories routinely outperform genuinely important news on Yandex’s aggregator. 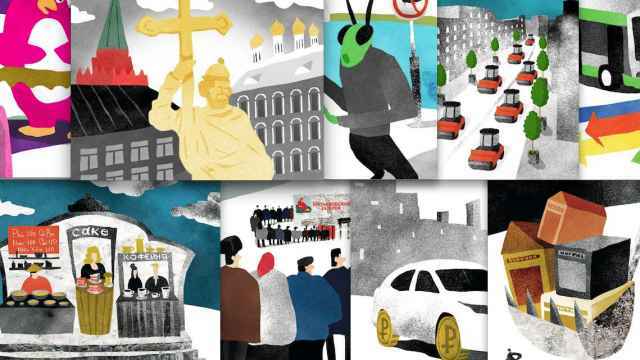 For example, on March 26, when mass protests against state corruption put central Moscow on police lockdown, the top slot on Yandex News displayed a headline promoting a local festival supported by the Moscow government. As a result, even though Russia’s independent media has covered Mayor Sobyanin’s controversial “renovation” scheme critically, it can’t compete with what is essentially a coordinated bot attack on the Russian Internet’s biggest news aggregator. These “bot newspapers” are often used in conjunction with “astroturf” demonstrations organized to create the impression that the mayor is not imposing his will on Muscovites but simply responding to their demands. On Sunday, after a 20,000-strong protest in central Moscow against the demolition scheme, the Vechernyaya Moskva (“Evening Moscow”) newspaper — once a respectable daily — reported that 35,000 Muscovites rallied in support of the demolition, showing readers a photograph from the anti-demolition protest. And the mayor’s office is especially proud of its mobile app, “Active Citizen,” which was introduced in 2014 and has become a major part of the publicity campaign to justify Sobyanin’s demolition program. Moscow City Hall describes Active Citizen (another taxpayer-funded project) as the envy of other world capitals and an instrument of direct democracy that provides officials with priceless public feedback. But there are a few issues with the app. First, most of the polls accessible on Active Citizen are of little if any consequence, such as nominations for a local talent show or the genres to be represented at a city-sponsored film festival. In the rare cases where the app allows Muscovites to vote on genuinely significant issues (such as the planned demolitions of khrushchevki), there is no way to verify the final tally independently. Unsurprisingly, the app’s numerous critics say it promotes faux democracy used to justify decisions already made at City Hall. With bot networks, phony newspapers, its own mobile app, and more, the Moscow mayor’s office controls its own bonafide propaganda empire. And the machinery at Sergei Sobyanin’s disposal even rivals Russia’s national efforts like RT, whose state funding is only 30 percent greater. 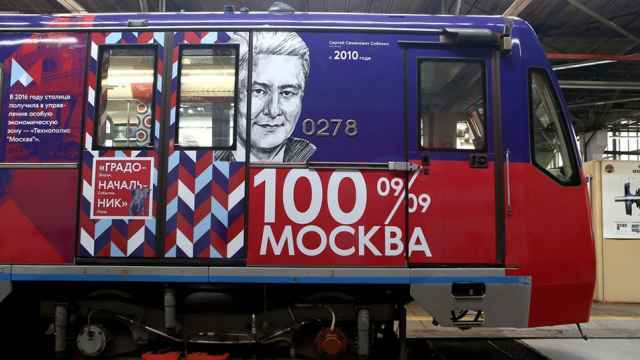 Ahead of Sunday’s elections, the multifunctional Sobyanin brand was promoted like the latest washing machine.